Lightly grease sheet pans. With lightly floured hands, roll a piece of dough between palms of hands to a rope approx 12-16 inches long. Continue with remaining pieces of dough. Place ropes of dough on lightly floured surface. To assemble bunnies; coil one rope into a circle on prepared sheet pan. Take second rope and cut off a 4-inch piece; set aside. Take remaining 8 inch rope and coil into another circle for head; placing it above the first coil. Take 4 inch piece and divide in half for ears. Attach to bunny head. 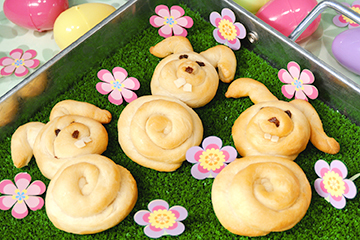 Continue with remaining pieces of dough, placing bunnies 3-4 inches apart on prepared pans. Brush with honey butter. Let rise until double in size. Bake in a preheated 375° oven for 15-20 minutes or until golden brown. Remove from oven and brush with additional honey butter. Let cool. With a tooth pick, poke holes for eyes and teeth. Take raisins (cut in half) and place in holes for eyes. Insert 2 slivered almonds for bunny teeth.